The State Belt interchanged many different railroads freight and passenger cars during its operational years. The railroad owened very fiew cars itself. The line rostered four idler cars and a few MOW (Maintenance of Way) cars is all. Idler flats SBRR 2 and 3 - in the yard under the Bay Bridge in their twilight years of service - Feb. 1987 - These cars will be returned to San Francisco in the future. Idler flatcars had a very specific purpose in life - they were used as spacers between the locomotive and freight cars that were being pushed onto barges. This was done to prevent the heavy locomotive from running onto the barge and accidentally sinking it. Since the freight cars were now several idler cars away from the locomotive, two idler cars had steps at the ends for the brakeman to stand on. The State Belt Railroad serviced several ferry slips along San Francisco's Embarcadero waterfront, the most famous being pier 43 near Fisherman's wharf. 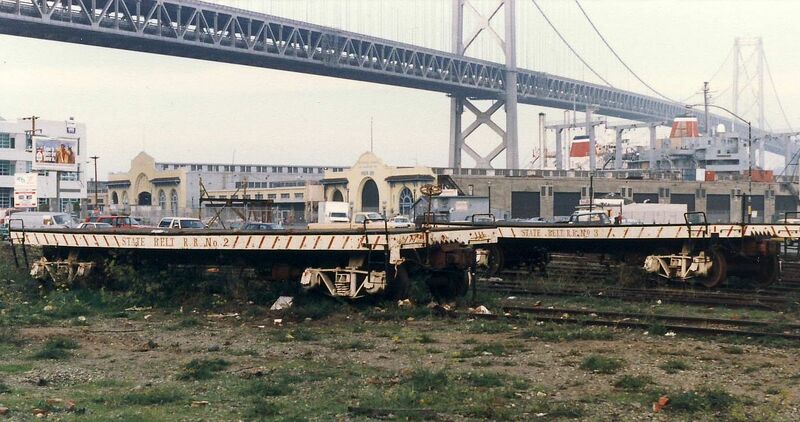 This ferry slip still stands today just a short walk from Pier 39, although it is now disconnected from the railroad tracks. (If you look carefully, you can still see tracks underneath the lawn in front.) The State Belt Railroad received freight cars here from the North Western Pacific R.R. (from Marin County), the Santa Fe (from Richmond), and the Western Pacific (from Alameda). The State Belt had four idler cars in service. Idler Flatcar #1 is one of four idler flatcars used by the State Belt Railroad of California (later known as the San Francisco Belt Railroad). Flatcars 1, 2 and 3 are identical, with the exception that #1 has the addition of end steps for the brakeman. These cars were rebuilt from turn-of-the-century oil tank cars. Curved tank braces still exist underneath the cars just over the truck bolsters. State Belt #1 was converted from Union Oil tank car UOX #94 (renumbered UOCX #921). These cars still retain their original arch-bar trucks, even though these were prohibited in the 1930's for interchange to other railroads. Since these cars were not intended for interchange, there was no need to change the trucks to a more modern type. Idler Flatcar #2 is one of four idler flatcars used by the State Belt Railroad of California. Flatcars 1, 2 and 3 are identical. These cars were rebuilt from turn-of-the-century oil tank cars. Curved tank braces still exist underneath the cars just over the truck bolsters. State Belt #2 was converted from Union Oil tank car UOX #98 (renumbered UOCX #917). These cars still retain their original arch-bar trucks, even though these were prohibited in the 1930's for interchange to other railroads. Since these cars were not intended for interchange, there was no need to change the trucks to a more modern type. This car is stored at the Double T Ag Museum in Stevinson CA. Plans are to bring the car back to the San Francisco area when display space is available. Idler Flatcar #3 is one of four idler flatcars used by the State Belt Railroad of California. Flatcars 1, 2 and 3 are identical. These cars were rebuilt from turn-of-the-century oil tank cars. Curved tank braces still exist underneath the cars just over the truck bolsters. State Belt #3 was converted from Union Oil tank car UOX #88 (renumbered UOCX #907). These cars still retain their original arch-bar trucks, even though these were prohibited in the 1930's for interchange to other railroads. Since these cars were not intended for interchange, there was no need to change the trucks to a more modern type. Idler Flatcar #4 is one of four idler flatcars used by the State Belt Railroad of California. This car was made by cutting down a reefer boxcar. A light wood deck was placed over the steel frame. This car also had steps for the brakeman. This car has been sold and was sent to Salinas. The plan is to reunite the car with a reefer body in the future. In the 1920s, paper records indicate income from box car and gondola car rentals to companies that used them in non-interchange (on line) service. To date no photographs have surfaced that show the cars. A few work cars and a crane were also used by the State Belt.